URBAN DAWGS - Positive Dog Training in Central NJ for dogs of all ages! 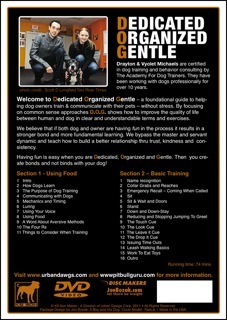 Dedicated Organized Gentle is a foundational guide to helping dog owners train and communicate with their pets without stress. By focusing on a common sense approaches D.O.G. shows how to improve the quality of life between human and dog in clear and understandable terms and exercises. We believe that if both dog and owner are having fun in the process, it results in a stronger bond and more fundamental learning. We bypass the master and servant dynamic and teach how to build a better relationship through trust, kindness and consistency. Having fun is easy when you are Dedicated Organized and Gentle. This will help you create bonds and not binds with your dog. This DVD DOES NOT ADDRESS aggression – resource guarding – separation anxiety or advanced behavior modification. This is a foundational dog training DVD that will provide guidance for a dog owner at any stage of their relationship with their dog. Whether you just got a new dog or have had your dog for years there is something inside Dedicated Organized Gentle that can assist you in developing a stronger bond and more reliable training! Q: Why should I buy a DVD? Will it really help? A: The most important aspect of having a well-trained dog is applying proper legitimate information in a kind consistent manner. This DVD will give you the tools you need to build a solid foundation of trust and communication with your dog. If you are happy with your dog’s training and behavior, we are happy! Q: Was this DVD filmed with all trainers’ dogs who are already trained, with everything slick and perfectly filmed? A: No. 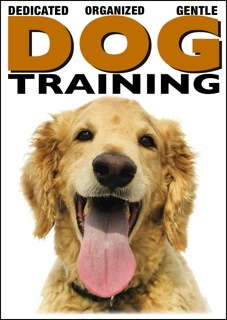 This DVD has footage from over a 7 year span and includes real world examples of training dogs. There are a few setups for educational purposes, but the vast majority of the DVD is comprised of dog training as it was happening. Q: If I buy this DVD and do all that it says, will my dog be trained forever? A: No. As you will find out from watching the DVD, dog behavior is mainly influenced by the environment. Human mechanics and timing along with savvy and common sense management will ensure your dog is well trained most of the time. After all no living being is 100% perfect and dogs should be allowed to be dogs in as many ways as they can unless it’s a detriment. It’s more about staying aware, flexible and having a plan based in how dogs actually learn. Q: Is this a long, complicated DVD? A: No. This DVD mainly has short, easy to understand segments that ages 7 to adult can understand and start using right away. We believe that dog training and understanding behavior should be fun, easy and made as simple as possible to get the point across. Many segments are only a few minutes long, so you can always go back and watch as needed. Q: Why should I but the DVD when I can hire you? A: Actually the combination of a live behavior consultation/dog training session and the DVD as a way to reinforce the information is the best combination. We’d love for you to get in touch about a dog training session please email us. Q: My dog has fear, aggression and/or separation anxiety. Does this DVD address those topics? A: No. This is a foundational DVD that educates dog owners on how to train and understand dogs legitimately through proven science. We only address the reasons why using fear and force methods can cause these issues, erode the dog’s behavior and the bond you have. Q: Will you have future DVDs dealing with more specific subjects? A: Yes. We’ll be sure to keep you posted. Thanks! View clips on our YouTube page.